Museu de Zoologia, Universidade de São Paulo; São Paulo, Brazil. Mollusks are one of the most diverse groups of organisms known to science. Humanity has described more than 80,000 species of snails and slugs (gastropods), clams, oysters and scallops (bivalves), squids and octopuses (cephalopods), tusk shells (scaphopods) and their less-known kin (e.g., polyplacophorans and aplacophorans), and many more are waiting to be discovered (Chapman, 2009). These soft-bodied and most often shell-bearing animals present a wide variety of shapes, colors and behaviors that has fascinated mankind for ages. Used as currency, tools, jewelry, medicine, and extensively collected and depicted in many different ways, mollusks are strongly tied to human history. It is not surprising that they were, and still are an important part of different cultures everywhere (Simone, 2003; Sturm et al., 2006). Naturally, in our everyday lives, some of us portray mollusks and their shells in paintings and decoration. They are present in ordinary objects, such as stamps and coins (Robertson, 2011; Todd, 2011). In modern culture, more specifically in the history of video games, the presence of mollusks is a remarkable one. In the late 80s, the so-called fourth generation of consoles (the 16-bit era) began, and with it, many vividly colored games came to be (Kent, 2001). Higher resolution allowed for digital artists to depict characters and draw backgrounds with richer detail. 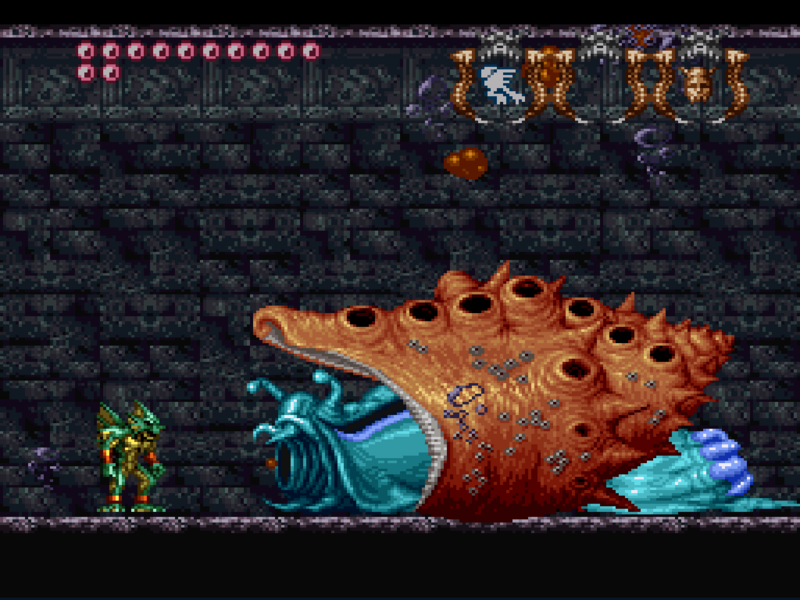 Mollusks showing up in 16-bit era games were naturally part of underwater scenery art, but some were given fairly important roles as memorable characters, plot devices, fierce antagonists and fearsome bosses. Herein we number some of these appearances and take the opportunity to discuss the real-world inspirations that probably originated these 16-bit representations. For practical reasons, only games that had an international or at least an English-language release are included in the following list. Several platforms existed in the 16-bit era, but the clash between its two greatest consoles was what we could call its “main event” (Fig. 1). The Sega Genesis (also known as the Mega Drive) was launched in Japan in 1988. Its greatest worldwide competitor, the Super Nintendo Entertainment System (short SNES, known as Super Famicom in Japan), was released two years later, in 1990 (Kent, 2001). Games developed for the SNES and Mega Drive platforms marked a generation. Some were the starting point for very successful franchises, and many of them depicted mollusks. Figure 1. Clash of titans. 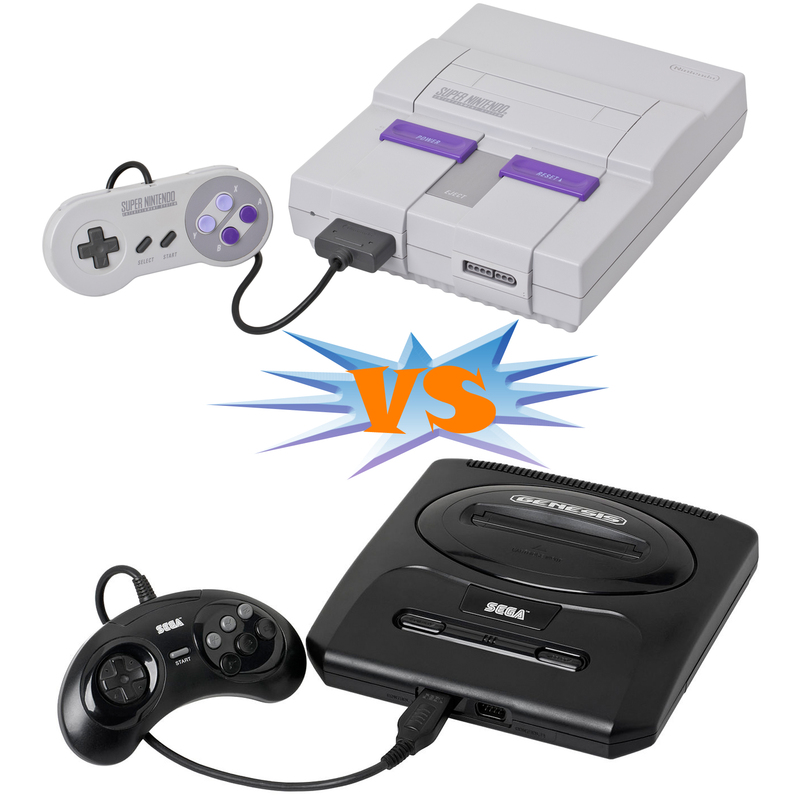 Super Nintendo Entertainment System (top) versus Sega Genesis (bottom). Photos by Evan Amos, extracted and modified from Wikimedia Commons. One of the most famous RPG franchises of gaming history, Final Fantasy includes several 16-bit titles such as Final Fantasy IV (1991), Final Fantasy V (1992) and Final Fantasy VI (1994), among others. These games have since been adapted for more recent platforms such as PlayStation, GBA and mobile. 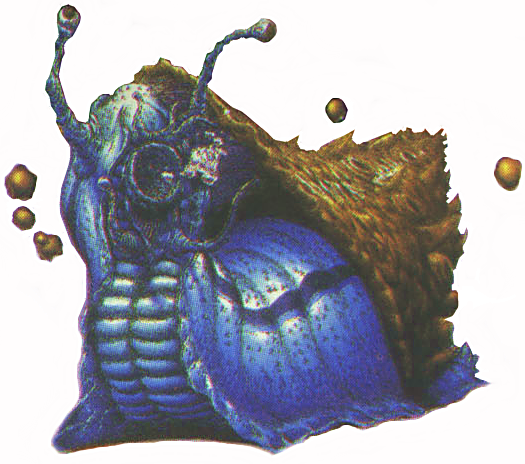 With a multitude of elaborately designed enemies (based on the beautiful artwork by Yoshitaka Amano), Final Fantasy games for the SNES include many mollusk-themed foes. Some of them received special attention from the developers, participating in some of the most memorable moments in the entire franchise (Fig. 2). The enemy names listed below are exactly as they appeared in the SNES, and may not coincide with more recent versions. Final Fantasy IV (FFIV) mollusk enemies are not exactly remarkable in terms of the game’s plot, but have curious design nonetheless. FangShel and its recolor EvilShel (Figs. 3A and 3B, respectively) are apparently based on bivalves in the family Pectinidae, commonly known as scallops (Fig. 5C). Mindflayer (Fig. 3C) is a Lovecraftian monster of sorts with a head somewhat resembling a squid (a teuthid cephalopod); mindflayers are also recurrent enemies in the Dungeons & Dragons role playing game franchise, and have a similar design. Octomam (Fig. 3D) is a huge colorful octopus-like creature with a crazy smile. It is one of the game’s bosses. Some species of blue-ringed octopus, such as Hapalochlaena lunulata (Fig. 5E), have a similar pointy mantle (the actual head of octopuses roughly corresponds to the region near the eyes; Jereb et al., 2005), and a comparable color pattern. Figure 3. 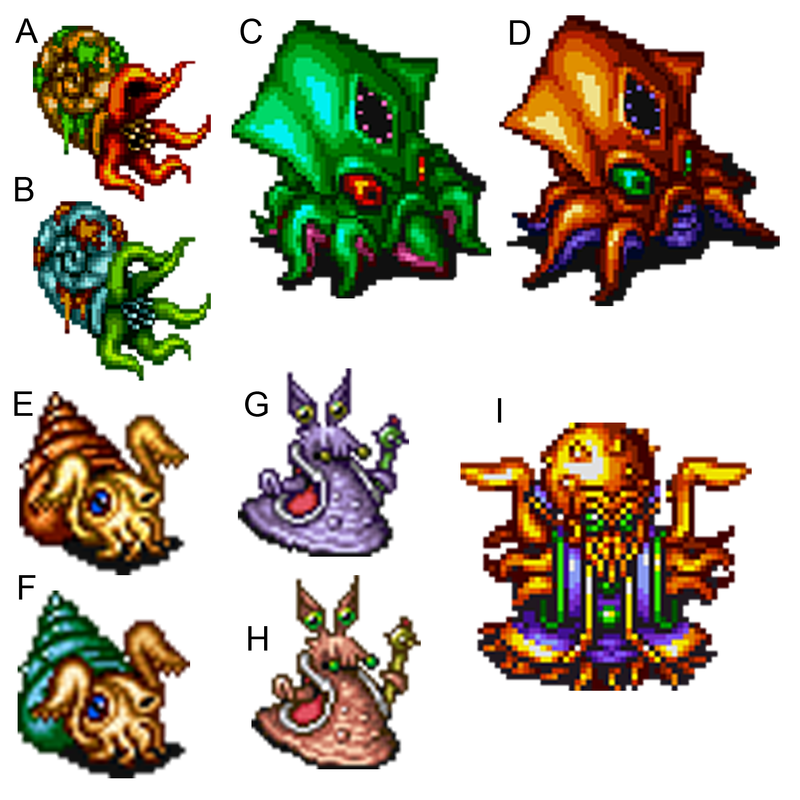 Mollusk foes from Final Fantasy IV and V (sprites from the mobile versions of both games). A. FangShel. B. EvilShel. C. Mindflayer. D. Octomam. E. Aquathone. F. Ammona. G. Sucker. H. Luneta. I. Mindflayer (FFV). J. Octoraken. K. MooglEater. L. RockGarter. M. Slug. 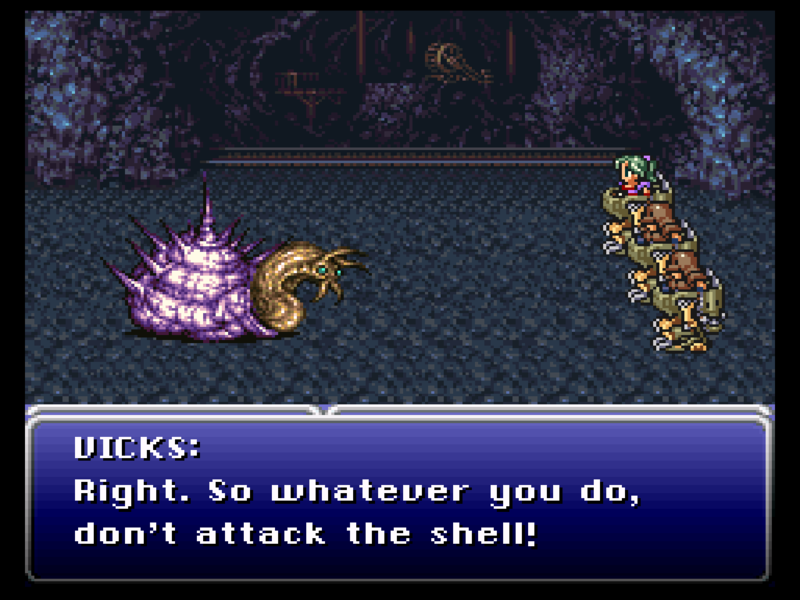 Fortunately, Final Fantasy V’s (FFV) roster of enemies had more mollusk representatives. Aquathone (Fig. 3E) and its recolor Ammona (Fig. 3F) are apparently based on reconstructions of ammonites (ancient extinct cephalopods; Fig. 5A), judging by its shell sculpture, cephalic hood (the triangular plate over its head, right above the eyes) and the numerous thin tentacles. Sucker (Fig. 3G) and its recolor Luneta (Fig. 3H) are apparently based on squids. Both have very clear tentacles with enlarged tips, and curiously vitreous bodies, through which their inner organs can be seen. A translucent body is a characteristic of some squid groups, like glass squids (family Cranchiidae, Fig. 5D). There is yet another Mindflayer (Fig. 3I), though its head resembles squids with smaller fins, such as some species in the family Cirroteuthidae. The last cephalopod representatives are Octoraken (Fig. 3J) and its recolor MooglEater (Fig. 3K), which are surprisingly realistic octopuses. Finally, RockGarter (Fig. 3L) and Slug (Fig. 3M) are different colored versions of a gastropod-based design. They are apparently simple representations of terrestrial gastropods pertaining to the limacoid clade, which is a grouping of air-breathing land snails and slugs that share a common ancestor. Coincidentally, there is a species of keelback slug (family Limacidae), Bielzia coerulans, in which juvenile specimens have a brown colored body while adults are completely blue. Figure 4. 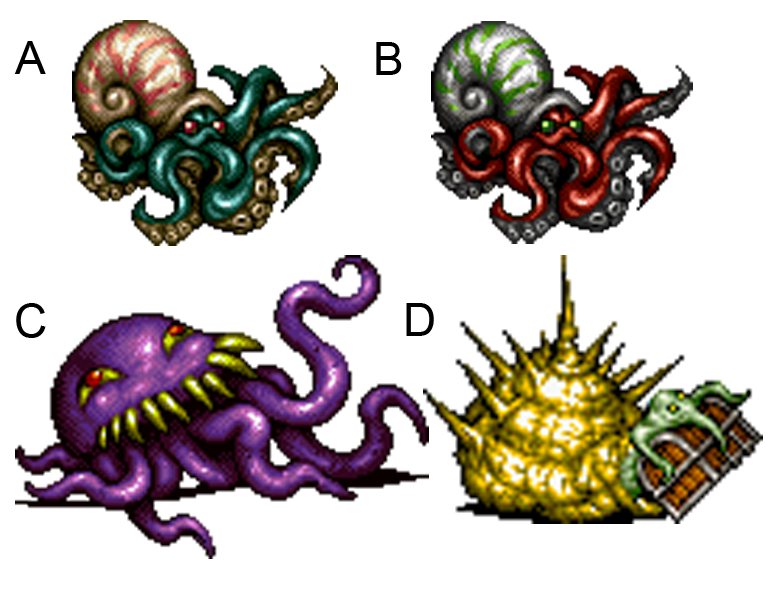 Mollusk enemies in Final Fantasy VI (sprites from the mobile version of the game). A. Nautiloid. B. Cephaler. C. Ultros. D. Presenter. Though the mollusks in Final Fantasy VI (FFVI) were not as numerous as in the preceding titles, some were given far more important roles. In fact, the very first boss in the game is none other than Whelk (Fig. 2), a scary giant gastropod. It surely looks like a terrestrial snail (despite the odd position of the eyes) but not much else can be said on the real world animal that inspired its design. The Presenter (Fig. 4D) is a recolored version of Whelk, with a different head-foot (it’s actually holding a treasure chest), and not much more can be said about it as well. Other minor enemies worth noting include Nautiloid (Fig. 4A) and its recolor Cephaler (Fig. 4B), which as the names may indicate are probably based on cephalopods. The shell color pattern of both resemble actual species of nautiloid cephalopods, such as Nautilus pompilius (Fig. 5B), though the arms with suckers do not. Finally, the most (in)famous of all these mollusk antagonists, and perhaps the most well-known mollusk in the Final Fantasy franchise, Ultros (Fig. 4C) is a purple octopus-themed creature with an odd “smile” and rolling eyes. It is undoubtedly a comic relief character, with a total of four (hilarious) appearances in the game. The most important encounter involves the cherished Opera House scene. Ultros denominates itself an octopus, though it lacks the characteristic arm suckers of most real-life cephalopods. It can spit ink, however, as it has an ink-related attack that can render player characters blind. 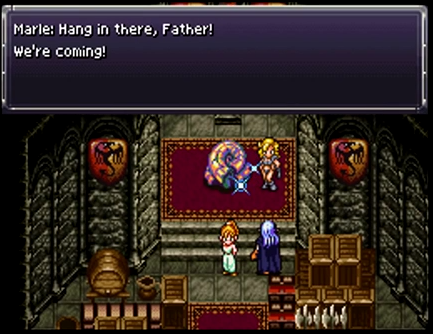 Since FFVI, Ultros is a recurrent character/enemy in the franchise. Super Mario is a world famous game series that actually predates the SNES, coming from the 8-bit generation of consoles. Nevertheless, the world’s most famous plumber evolved amazingly well into the 16-bit era, with several successful titles such as the remakes of Super Mario Bros. 2 and 3, Super Mario World, and Super Mario RPG: Legend of the Seven Stars, in the early to mid-1990s. A humble yet persistent mollusk antagonist in the series, Blooper is present in almost every underwater stage in several Mario titles. It is pretty much a squid-like creature (Fig. 6), and its main offensive strategy (as is the case in most of the earliest Mario’s enemies) consists of causing damage upon contact. A very basic maneuver, of course, but a pretty dangerous one in confined spaces crowded with other enemies. Blooper is loosely based on real world squids. It possesses enough features to be recognized as a cephalopod (the class of mollusks that includes octopuses, squids and their allies) and more specifically a Teuthida (the order that includes squids and their allies). It has arms and tentacles with suckers, and fins on both sides of the body (not exactly a head), conferring it a pointy silhouette, but not much else can be inferred from its relatively simple and stylized design. Breath of Fire (BoF) is a roleplaying game series that had its first installment launched in 1993 for the SNES. The sequel, Breath of Fire II, came a year later. Both games are focused on the adventures of Ryu, a dragon-descendant warrior on a continuous quest to uncover the history of his clan. As is the case in most RPGs, both BoF games had quite varied enemy lists. A few of these opponents were apparently based on mollusks. The earliest mollusk-themed appearance in the first game is Tentacle (Fig. 7A), which would be followed much later by its recolored version Nautulis (Fig. 7B). They are probably based on reconstructions of ammonites (Fig. 5A), very similarly to some Final Fantasy monsters (see above). Squid and Octo (Figs. 7C and 7D, respectively) are cephalopod twins, and two game bosses no less. Judging by the shape of the mantle and fins, both were based on squids, but their real-world affinities beyond that are uncertain. Breath of Fire II had a few more mollusk adversaries, starting with Amonica (Fig. 7E) and Cuttlecb (Fig. 7F). They look like an odd crossover between a cephalopod (tentacles and arms, very large eyes and an evident, uncovered siphon) and a marine gastropod belonging in the superfamily Trochoidea, judging by the rounded pyramidal outline of their shells. Roadslug (Fig. 7G) and R-Slug (Fig. 7H) are heavily stylized representations of terrestrial gastropods in the limacoid clade (see the Final Fantasy section above). Finally, the only mollusk boss in the game is Babaruku (Fig. 7I), the evil high priest of St. Eva in its Lovecraftian might. It looks like a mindflayer of sorts, a nasty human-octopus hybrid, but not much else can be said on its possible real-life counterpart. Figure 7. 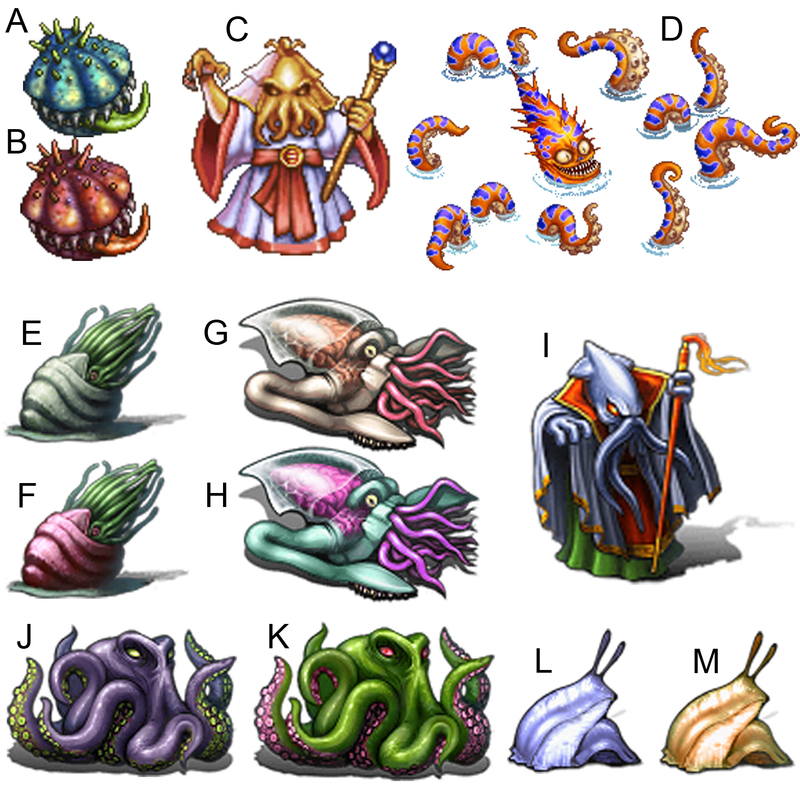 Molluscan enemies from Breath of Fire and BoF II (sprites from the actual games). A. Tentacle. B. Nautulis. C. Squid. D. Octo. E. Amonica. F. Cuttlecb. G. Roadslug. H. R-Slug. I. Babaruku. First released in Japan in 1994, the game had a sinister plot involving rival demon lords fighting over ancient magical gems of power. This, as well as the fantastic organ music, creepy characters and enemies and beautifully-drawn gloomy scenarios gave the game one of the darkest tones of its generation. Amidst this demonic war for absolute supremacy, an underwater stage boss – named Holothurion (Fig. 8) – actually posed a serious threat as a horrendous giant sea snail. His arsenal of menacing moves included creating overwhelming water currents that tossed the player character around (even toward deadly shell spikes or its huge uninviting mouth), and spitting chunks of an apparently toxic ink-like substance. It could also retract its body into the shell as a defensive maneuver – a very “snaily” move indeed. Figure 8. Top: Demon’s Crest protagonist Firebrand (in his green water-dwelling form, to the left) battles Holothurion, the giant demonic snail (right). (Screenshot from the actual game.) Bottom: Original artwork of Holothurion from the game. Despite the hyperbolic boss-like size, Holothurion looks to be an amalgam of marine and perhaps terrestrial snail species. It has a bulky, orange-colored shell, with spines on the body whorl’s (the largest shell whorl) shoulder and on the upper portion of each whorl. This outline and color is reminiscent of some iconic strombid species like the queen conch, Lobatus gigas or the West Indian fighting conch, Strombus pugilis (Fig. 9D). The shell’s aperture (opening) has an unusual outline, and a clear, long siphonal canal is apparent. The series of holes observed on the shell’s dorsum are found in a few gastropods (Fig. 9C), such as abalones (family Haliotidae; Poutiers, 1998). The demonic snail’s body, or rather its soft parts, is a matter of further discussion. 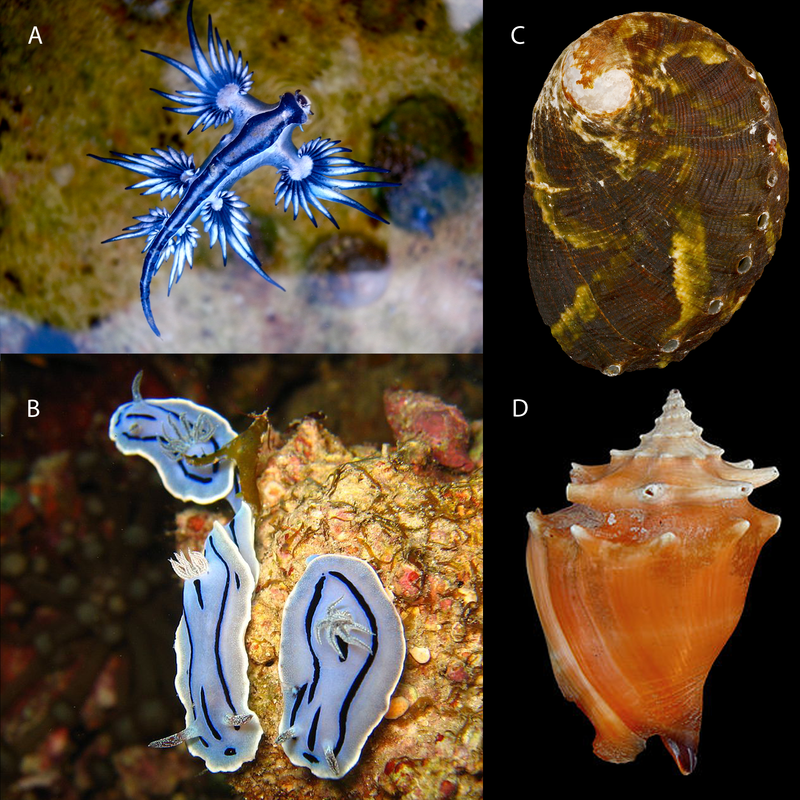 The blue coloration is not itself rare, but it is more common in non-shelled species such as nudibranchs (sea slugs). Besides being possibly similarly blue, the sea slugs Glaucus atlanticus (Fig. 9A) and Chromodoris willani (Fig. 9B) both may have darker blue lateral stripes with an adjacent, lighter stripe just below it. The posterior portion of Holothurion’s foot has a few “spiky” appendages. They could be part of a very bizarre operculum (a structure that closes the shell aperture when the animal retracts into the shell), if they weren’t actually mobile structures that react to the snail’s mood. This may be another similarity with some nudibranchs, which have comparable posterior appendages (gills; as in C. willani), some of which can be contractile or retract into a cavity (Fahey & Gosliner, 2004). The demonic snail’s head looks like that of most shelled marine gastropods, with a single pair of cephalic tentacles. They are probably eye-bearing, though there are no discernible eyes on the in-game sprite. This somehow contradicts the official artwork (Fig. 8), which depicts two pairs of cephalic tentacles most similar to a land snail, and the upper pair appears to bear eyes at the tips. In any case, after such an in-depth analysis, I can only conclude that such a freakish molluscan gestalt could only be brought into existence by demonic forces. 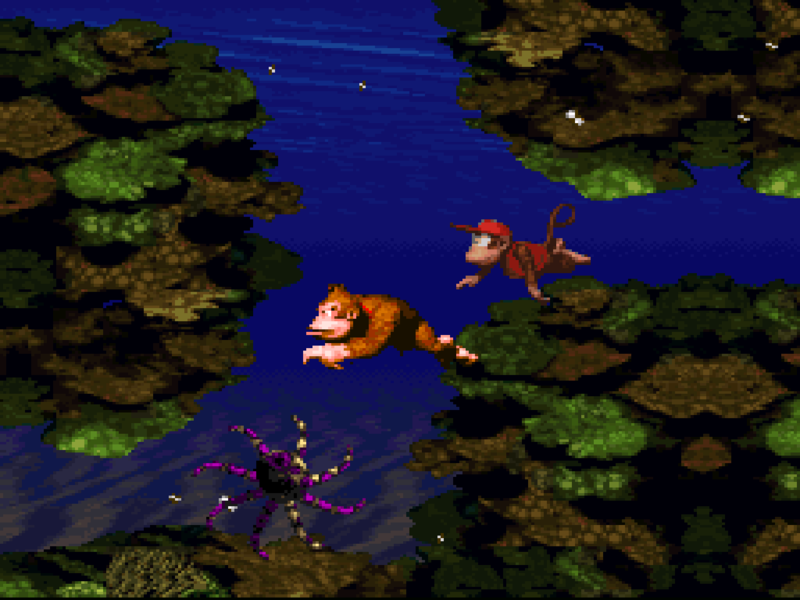 The Donkey Kong Country series featured 3 games in the SNES platform. It is a very successful franchise that began as a very dynamic platformer. The game protagonists and antagonists are animal-based: simian protagonists (the Kongs) and their animal buddies face off against an evil crocodile gang and their allies in richly-designed, nature-themed scenarios. The first game of the series was released in 1994. It is the only one among its 16-bit counterparts to include mollusks. Clambo (Fig. 10) is a pearl-spitting bivalve, a stationary opponent waiting to hit any simian swimmers with vicious underwater pearl bullets. Well, in fact and contrary to what the name indicates, Clambo might be an oyster (family Ostreidae), and not an actual clam. Judging by the thick shell with strong undulated sculpture, it could be a zigzag oyster (genus Lopha). Alternatively, it could indeed be a clam, a giant clam in the genus Tridacna (Fig. 12A). Tridacnids have a somewhat similar shell outline and are known to produce pearls, though not of the nacreous (iridescent) type (WJC, 2013). Giving the name some credit, the second option seems more plausible. Croctopus (Fig. 11), a swirling and rather deadly cephalopod, is another recurring mollusk enemy and perhaps the most fearsome (and sometimes annoying) one in the game. Its offensive abilities are not the fanciest of the franchise, merely consisting of inflicting damage to the player characters upon contact. It is, however, invincible and often very fast-moving, and will invariably damage the player characters upon touch despite the circumstances (even while riding your favorite swordfish buddy, for instance). Surely, it was a foe to avoid. Croctopus’ design is loosely based on Indo-Pacific blue-ringed octopus species belonging to the genus Hapalochlaena (Fig. 12B). Blue-ringed octopuses are venomous animals, and their venom is nothing short of a cocktail of deadly substances. Accidents involving humans are often fatal, so any resemblance between Croctopus’ offensive power and real life is -not- a coincidence (Sheumack et al., 1978; McMichael, 2013). Figure 12. Possible real-life inspirations for Clambo and Croctopus, respectively. A. A live specimen of Tridacna (public domain image). B. A blue-ringed octopus, Hapalochlaena maculosa (photo by Sylke Rohrlach, extracted and modified from Wikimedia Commons). Another enemy worth mentioning is Squidge, a fast-moving, translucent creature. Despite the name, it does not have much to do with squids, being more of a jellyfish (a cnidarian) with an odd pair of angry eyes. It moves around by agitating its gelatinous body in an umbrella-like fashion, and its tentacle-like posterior appendages are more akin to cnidarian oral arms, lacking the typical suckers of cephalopod arms and tentacles. The first Mega Man X game was released in Japan in 1993 and in North America a year later. Set in a dystopian future, the game’s plot comes down to an Aasimovian conflict between evil robots (mavericks) aimed at destroying their human creators and the ones that wish to defend them. 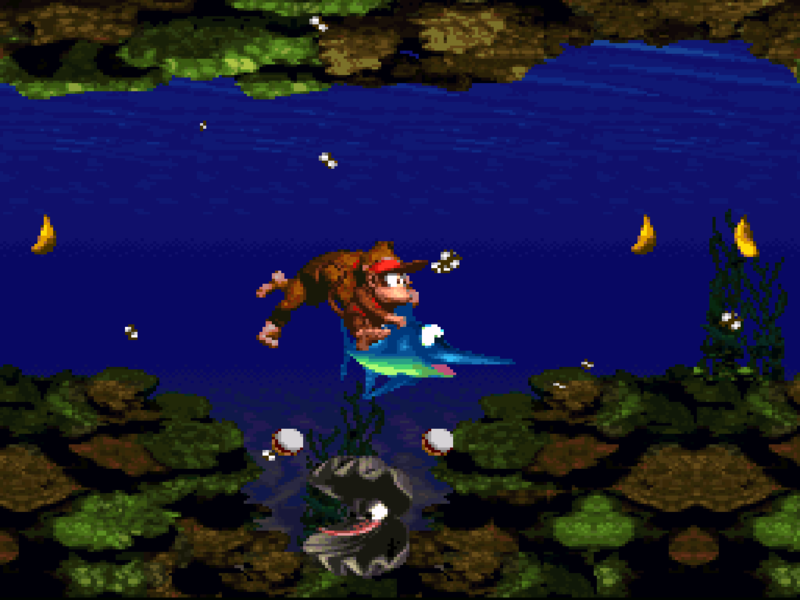 Bosses in the X series were mostly animal-themed. Their design was based on lizards, mammals, fish, insects, birds and, of course, mollusks. Launch Octopus (Figs. 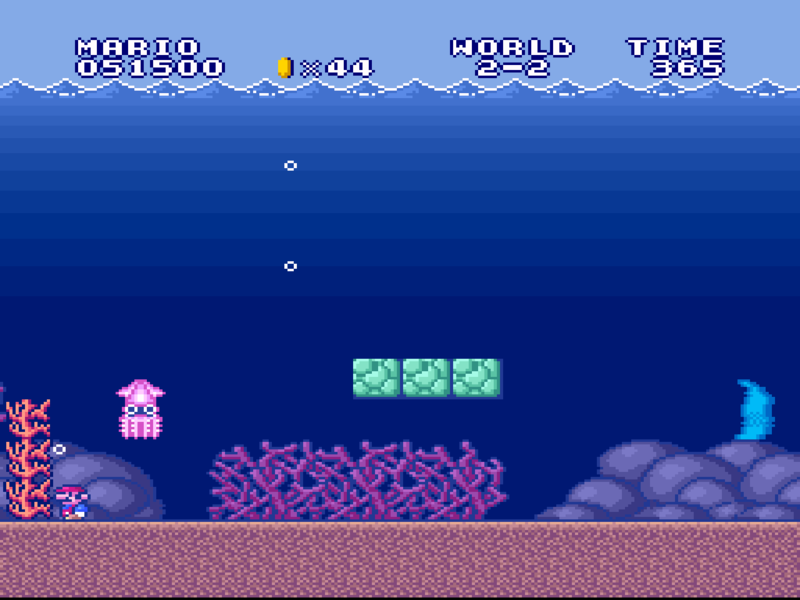 13, 15A) was the underwater stage boss in the first game. Featuring six torpedo-firing arms (which adds to eight members if you count the legs), and the power to produce powerful whirlpools, this octopus-themed enemy could give the player a good headache. It had more weaknesses than a normal Mega Man boss would however; it was vulnerable to two of X’s weapons, one of which (boomerang cutter) could sever his awesome arms, greatly crippling his combat ability. In any case, assigning this robotic foe to a single cephalopod species or genus is no easy task. There is a small hint to a possible biological correlation, though: his arms have a single row of suckers, or rather, devices that look like suckers. Uniserial suckers are characteristic of some octopod families, like Eledonidae, Amphitretidae and Megaleledonidae (Strugnell et al., 2014). Amphitretids have vitreous bodies, and Megaleledonids inhabit arctic environments. Both facts cannot be applied to Launch Octopus, leaving Eledonidae as the most plausible option. Snails may not be the quickest animals out there. 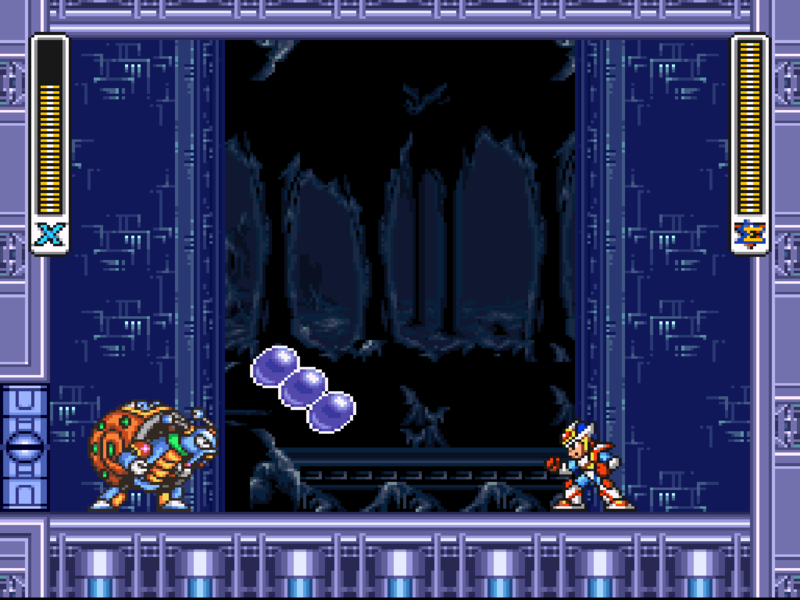 One might assume they would not make for astounding enemies in a quick-paced shooter/platformer like Mega Man X2. Well, Crystal Snail (Figs. 14, 15C), a snail-themed maverick, proves this theory wrong. Possessing an invulnerable shell with rocket-like propellants, it can fly around the screen, and even change its trajectory in midair. It can also spit a gooey mucous substance that crystalizes upon contact, imprisoning Mega Man in a shiny crystal coffin. To top it off, Crystal Snail has an amazing time-slowing special ability, which turns the world into a sluggish hell while it moves freely. On a first glance, Crystal Snail’s design is based on a terrestrial gastropod, bearing two pairs of cephalic (head) tentacles and a characteristic shell. The shell itself is bulky, and seems to be somewhat planispiral (coiled in a single horizontal plane). There are several species with planispiral shells, but most are not that bulky or rounded. It seems more likely that the maverick’s design was based on a more common species such as the garden snail (Cornu aspersum), and the shell’s odd coiling axis is merely an artistic interpretation. Figure 15. 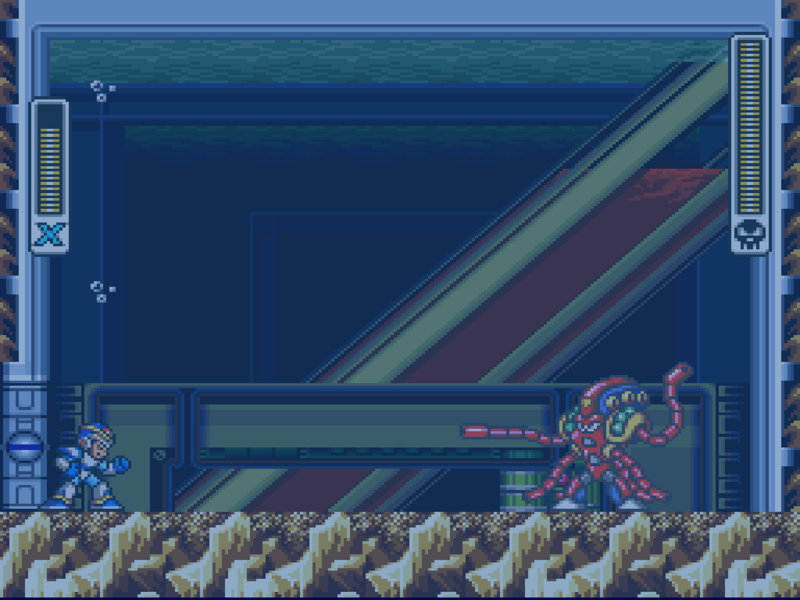 Mega Man X foes and their plausible natural inspirations. A. Launch Octopus (official game art by Capcom). B. The Eledonid cephalopod, Eledone cirrhosa (public domain image from a 1896 monograph by Jatta Giuseppe). C. Crystal Snail (official game art by Capcom). D. The common garden snail, Cornu aspersum (image by Rasbak, extracted and modified from Wikimedia Commons). Released in Japan and North America in 1995, Chrono Trigger became a commercial success, and received extensive critical acclaim. It was an interesting RPG, with an innovative combat mechanics and an enticing plot revolving around time travel and apocalyptic events. An interesting, optional aspect of the game’s plot, the rainbow shell (Figs. 16, 17A) was a huge specimen that remained hidden in a series of unnatural pre-historic caves in 600 A.D, guarded by a plethora of dinosaur enemies and a fearsome Tyrannosaurus-like boss. There it lied, waiting to be discovered by Crono, the game’s silent protagonist, and his friends. Once claimed by the heroes and after a series of plot twists involving the kingdom of Guardia in a future timeline, the rainbow shell became part of the royal treasure. It was, in fact, its most important piece, and could also be used as raw material to fabricate some of the game’s most powerful gear and weapons (such as the Rainbow blade, Crono’s top weapon). At first glance – and considering the “ancient pre-historic cave” context – the rainbow shell looks like a fossilized ammonoid, an ancient shelled cephalopod. Indeed, some ammonoids are among the largest shelled mollusks that ever lived (Monks & Palmer, 2002). Given its coiling axis and the strong axial sculpture (with thick, sequential ribs), as well as its huge size (it took no less than 8 soldiers to move it out of the cave! ), the rainbow shell could have pertained to the family Desmoceratidae, like species in the genus Parapuzosia, which could reach over 3 m in diameter (Teichert & Kummel, 1960). Ammonoid fossils with an iridescent shade (a rainbow-like shine) are not unheard of (Fig. 17B), and could have inspired Akira Toriyama’s artwork and in-game sprite. Figure 17. Iridescent lookalikes. A. The Rainbow shell (official Chrono Trigger art by Akira Toriyama). B. An iridescent ancient ammonite fossil on display at the American Museum of Natural History, New York (image by James P. Fisher III, extracted and modified from Wikimedia Commons). One of the most famous series in the 16-bit era and greatly cherished by Sega Genesis owners, Sonic the Hedgehog had many successful titles in the early to mid-90s. Sonic games were very agile platformers, with colorful and complex ambiences full of twists and turns, challenging enemies and bosses. Enemies in the series were mostly robots created by the infamous Dr. Ivo “Eggman” Robotnik. The (not so) good doctor based some of his creations on mollusks, of course. In Sonic the Hedgehog 2, Octus (Fig. 18A) is an octopus-like robot that jumps using its robotic arms, and tries to hit Sonic with energy projectiles. It is obviously based on a cephalopod, but not much else can be inferred. In sonic the Hedgehog 3, Clamer (Fig. 18B) and Snail Blaster (Fig. 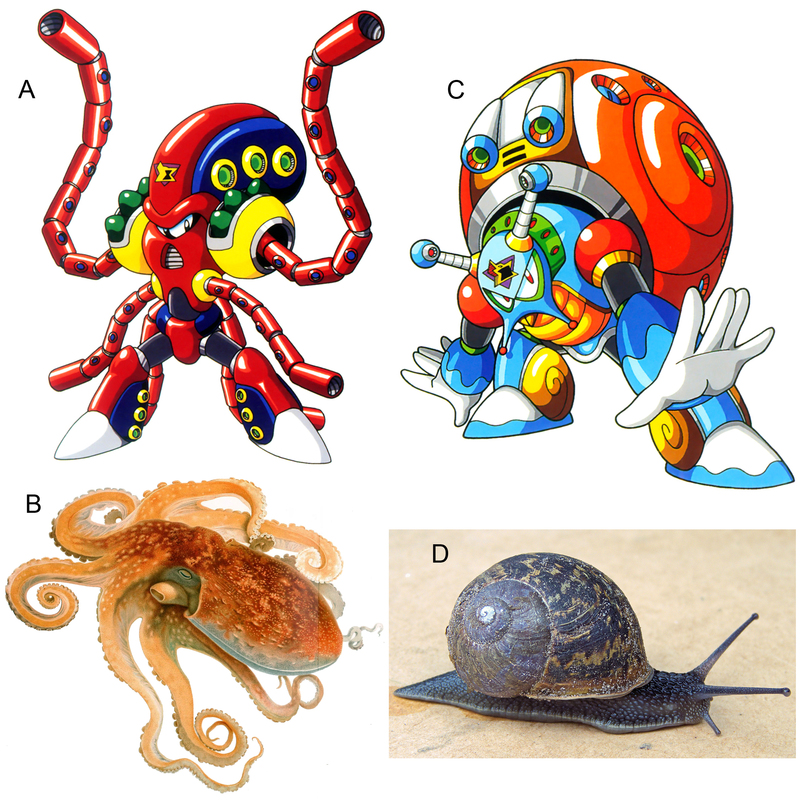 18C) were, respectively, bivalve and snail (a terrestrial gastropod) based artillery robots. While they’re not attacking the protagonists, both can hide inside their shells, which offer considerable protection. Earthworm Jim 2 (1995): A smaller and recurrent enemy in the Level Ate stage, it appears to be based on terrestrial gastropods. Joe & Mac 2 (1994): Had some minor unnamed mollusk-themed antagonists. 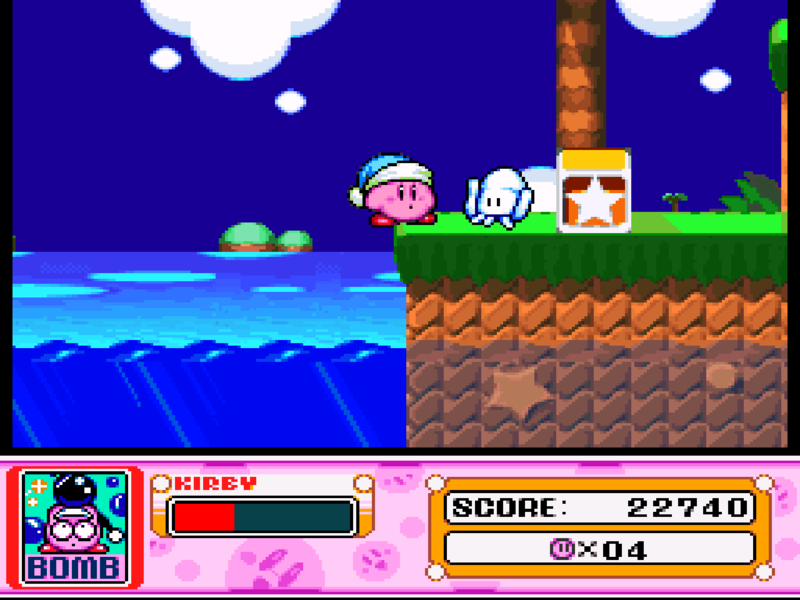 Kirby Super Star (1996): A minor, white squid-like enemy called Squishy (Figs. 18D, 19) is present throughout the game. It is similar to Super Mario’s Blooper in some ways. The Legend of Zelda: A Link to the Past (1991): A very common mollusk antagonist called Octorok (Fig. 18E) attacked the protagonist by spiting rocky projectiles. It is a stylized octopus, apparently, and has a Dark World counterpart called Slarok. Lufia II (1995): A few of the game’s antagonists were mollusks, namely Evil Fish (an octopus, Fig. 18H), Drill Shell (a marine snail with a spiky shell, Fig. 18G) and Ammonite (yet another ammonoid-based monster, Fig. 18I). Super Ghouls n’ Ghosts (1991): A devilish red-shelled clam named Eyeball Clam (Fig. 18F) attacked the protagonist by spitting eyeballs towards him. It is surely based on real-life clams (probably tridacnid, see Donkey Kong above). Figure 18. Sonic the Hedgehog’s mollusk enemies, and some additional honorable mentions. A. Octus (official art from Sonic the Hedgehog 2). B. Clamer (official art from Sonic the Hedgehog 3). C. Snail Blaster (official art from Sonic the Hedgehog 3). D. Squishy (official art from Kirby’s Dream Land). E. Octorok (official art from The Legend of Zelda: A Link to the Past). F. Eyeball Clam (official art from Super Ghouls n’ Goblins). G. Drill shell (sprite from Lufia II). H. Evil Fish (sprite from Lufia II). I. Ammonite (sprite from Lufia II). Chapman, A.D. (2009) Numbers of Living Species in Australia and the World, 2nd ed. Australian Biological Resources Study, Canberra. Fahey, S.J. & Gosliner, T.M. (2004) A Phylogenetic analysis of the Aegiridae Fischer, 1883 (Mollusca, Nudibranchia, Phanerobranchia) with descriptions of eight new species and a reassessment of phanerobranch relationships. Proceedings of the California Academy of Sciences 55(34): 613–689. Jereb, P.; Roper, C.F.E. ; Vecchione, M. (2005) Introduction. In: Jareb, P. & Roper, C.F.E. (Eds.) Cephalopods of the World. An annotated and illustrated catalogue of cephalopod species known to date. Volume 1. 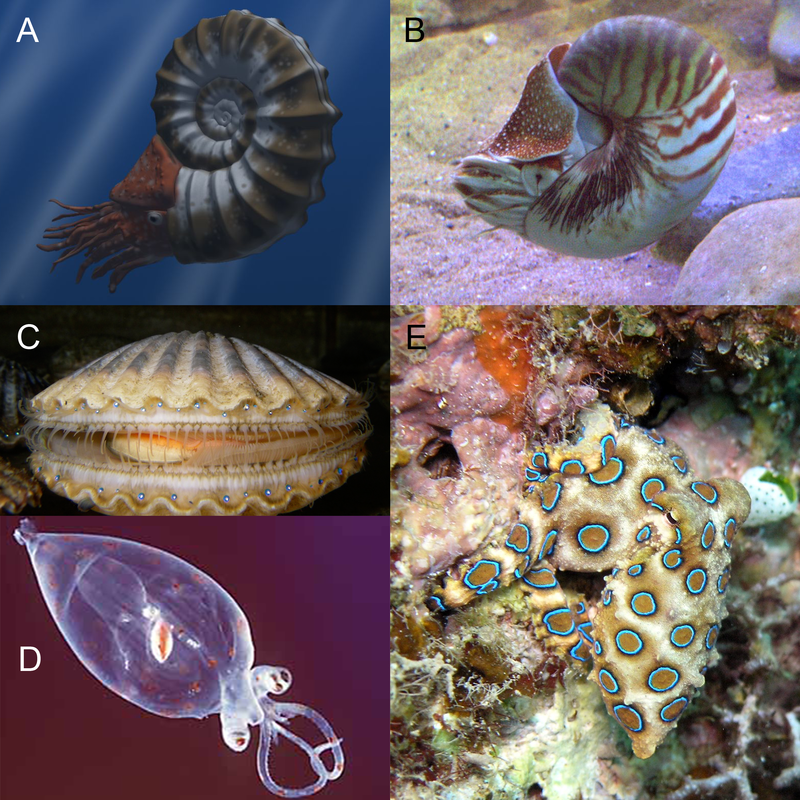 Chambered nautiluses and sepioids (Nautilidae, Sepiidae, Sepiolidae, Sepiadariidae, Idiosepiidae and Spirulidae). FAO Species Catalogue for Fishery Purposes No. 4, Vol. 1. FAO, Rome. Pp. 1–37. Kent, S.L. (2001) The Ultimate History of Video Games: From Pong to Pokémon and Beyond – The Story Behind the Craze that Touched Our Lives and Changed the World. Three River Press, New York. McMichael, D.F. (2013) Mollusks – classification, distribution, venom apparatus and venoms, symptomatology of stings. In: Bücher, W. & Buckley, E.E. (Eds.) Venomous Animals and Their Venoms, Vol III: Venomous Invertebrates. Elsevier, Amsterdam. Pp. 373–393. Poutiers, J.M. (1998) Gastropods. In: Carpenter, K.E. (Ed.) The Living Marine Resources of the Western Central Pacific, Vol. 1: Seaweeds, corals, bivalves and gastropods. Food and Agriculture Organization of the United Nations (FAO), Rome. Pp. 363–686. Robertson, R. (2011) Cracking a queen conch (Strombus gigas), vanishing uses, and rare abnormalities. American Conchologist 39(3): 21–24. Simone, L.R.L. (2003) História da malacologia no Brasil. Revista de Biologia Tropical 51(3): 139–147. Sheumack, D.D. ; Howden, M.E. ; Spence, I.; Quinn, R.J. (1978) Maculotoxin: a neurotoxin from the venom glands of the octopus Hapalochlaena maculosa identified as tetrodotoxin. Science 199(4325): 188–189. Sturm, C.F. ; Pearce, T.A. ; Valdés, Á. (2006) The mollusks: introductory comments. In: Sturm, C.F., Pearce, T.A., Valdés, Á. (Eds.) The Mollusks: A Guide to Their Study, Collection, and Preservation. American Malacological Society, Pittsburgh. Pp 1–7. Strugnell, J.M. ; Norman, M.D. ; Vecchione, M.; Guzik, M.; Allcock, A.L. (2014) The ink sac clouds octopod evolutionary history. Hydrobiologia 725: 215–235. Teichert, C. & Kummel, B. (1960) Size of endoceroid cephalopods. Breviora Museum of Comparative Zoology 128: 1–7. Todd, J. (2011) Conch shells on coins. American Conchologist 39(1): 12–13. WJC (World Jewelry Confederation). (2013) The Pearl Book. Natural, Cultured & Imitation Pearls — Terminology & Classification. CIBJO, Milan.